I received a free ebook of this title from the publisher in exchange for an honest review. A nice trip down memory lane to my childhood growing up with these figures and the accompanying cartoon. 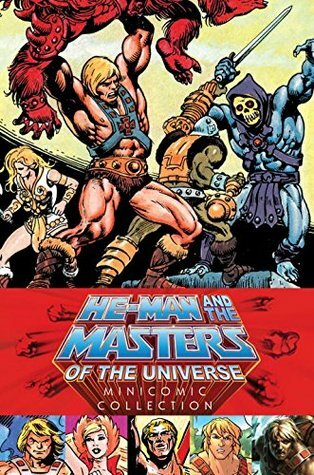 The ARC only contains the first few minicomics which is a little confusing as He-Man is not living in Castle Grayskull and does not have his alter-ego of Prince Adam, in fact he’s no relation of the King at all. The biggest disappointment for me was the interviews with the original writers however. He-Man was a big part of my early play time and it’s a shame to read that those involved didn’t have any passion for the series, just viewing it as a paycheck that was probably going to be a flop anyway. It’s not entirely their fault but to hear about one of the formulative parts of your childhood talked about in this way is unpleasant and I really would rather the interview was absent if it doesn’t do anything to increase the love of the subject matter. As a side note for others of a likewise age that grew up with He-Man I suggest taking a look at the Twitter account @GrumpySkeletor for a good laugh. 3.5/5 Mostly for the nostalgia value rather than the writing.